Stoke were knocked out of the League Cup after suffering a 2-0 defeat against Bristol City. They had also lost their last two games in the league, so a good result for them here was crucial. Even though Chelsea drew their last league game against Arsenal, they won 5-1 against Forest in the Cup and managed to rest most of their key players for the match against Stoke. Mark Hughes has been using the 3-4-3 formation this season, and even though two of his starting centre backs were unavailable for this game, he decided not to change his tactics. Glen Johnson replaced Kurt Zouma (on loan from Chelsea) as a right centre back. Meanwhile, Sobhi was introduced to the squad instead of Kevin Wimmer and played as a left wing-back, which meant that Erik Pieters was moved to the left side of the back three. Antonio Conte also changed two of his starting defenders. Rüdiger was preferred over Cahill for this fixture, and Christensen replaced the suspended David Luiz. Cesc Fabregas was relegated to the bench and replaced by Bakayoko. Chelsea’s game plan was clear from the start, and it caught Stoke by surprise in the first minutes of the match. The Potters played with a very high defensive line, and Chelsea tried to exploit that by playing balls over the top of Stoke’s defence. It took Alvaro Morata only two minutes to find the net after bad positioning from Stoke’s back line and a great pass from Azpilicueta. It’s not the first time that Morata scored after an Azpilicueta pass, so it’s clear that Chelsea have worked on this combination on the training ground. Chelsea saw Stoke’s weakness and continued with their approach. 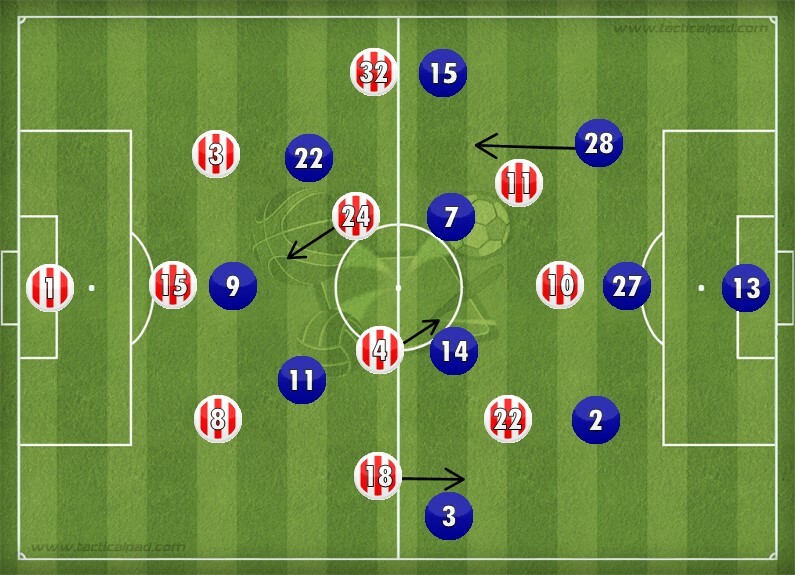 Seeing as both teams played with the same formation, Stoke tried pressing the visitors high up the pitch, but the visitors’ back line had ball playing defenders in the likes of Rüdiger, Christensen, and Azpilicueta, so Stoke’s pressing didn’t bother them too much. Bakayoko had to play the Fabregas role and dropped deep when his team was in possession. In the 4th minute, he managed to bypass Stoke’s press with a pass to Morata who laid off the ball to Willian. Pieters and Indi didn’t stick tight to their men and Willian had a great chance to play Pedro through, but the pass was unsuccessful. Still, Chelsea showed just how vulnerable Stoke were at the beginning of the game by attempting these through balls. However, Stoke managed to regain control of the game by winning the ball off Chelsea’s strikers and retaining possession in the opposition’s half. The Blues didn’t bother pressing high up the pitch and decided to drop deeper after they took the lead. The main threat from Stoke was Shaqiri who was consistently looking for empty spaces by either dropping deep or moving more to the right. He was at the centre of Stoke’s attacks and created a lot of problems for Chelsea’s defence. On one occasion, Shaqiri managed to receive the ball in the space between Bakayoko and Rüdiger, which caused the German defender to step out of his position. Diouf, who was playing very high up the pitch and was mostly attacking during the game, made a great run inside and outpaced Alonso. Fortunately for the visitors, Azpilicueta was at the far post and managed to block Diouf’s pass, but this situation showcased Chelsea’s defensive problems early in the match. Conte probably took notice of Shaqiri’s impact on the game and gave instructions to his defenders because Rüdiger started marking him tightly and didn’t allow the Swiss player any time on the ball, even if the attacker was in his own half. Chelsea didn’t look in control of the game, but Pedro intercepted a bad pass from Fletcher and placed the ball in the corner of the net. After their strong start, Chelsea didn’t create anything up until the second goal, so Pedro’s strike came at a very important moment for them. Alonso didn’t have a great game and was lucky not to be sent off in the second half. Stoke targeted his zone right from the start, and he had a lot of trouble playing 1v1 against Diouf. He made some silly tackles in the second half and didn’t look composed at all. Conte reacted immediately and brought him off for Gary Cahill, which meant that Azpilicueta was moved to left wing-back. Cahill started as the right centre-half, so Mark Hughes responded by bringing on Peter Crouch who made an instant impact by out jumping Cahill in the penalty area and creating a dangerous situation. It was evident that Cahill wasn’t used to playing on the right side. First, Choupo-Moting dribbled past him, and the Englishman was lucky that Stoke’s forward bumped into him on his way to the ball; otherwise that could’ve been a great chance for the home team. Then Shaqiri saw that Cahill was too close to Christensen and dribbled past Chelsea’s skipper with ease. Once again, Conte was quick to make changes by moving Cahill to his preferred left side and Rüdiger to the right. Chelsea continued to defend deep, and Stoke didn’t threaten them too much, except for a set piece when Fletcher missed from short range. Fabregas replaced Pedro and Chelsea switched to a 3-5-2 formation. The Spanish midfielder played deeper than Kante and Bakayoko, which allowed him to dictate the tempo of the game. The two French midfielders were allowed more freedom to run forward and offer additional support when Chelsea attacked on the counter. Chelsea scored their third after Bakayoko intercepted a pass from Glen Johnson and Alvaro Morata outpaced Fletcher and scored with an excellent finish. Cahill also played a role here by closing down Shaqiri quickly and limiting Johnson’s passing options by forcing him to play a more central pass. Chelsea’s defence looked way better after they changed their formation. The extra man in the middle gave Chelsea’s back three additional protection, and they didn’t have to step out as much to stop Shaqiri. Meanwhile, Hazard and Morata were waiting up top for any counter-attacking opportunities. Diouf spent most of his energy on attacking, which allowed Azpilicueta to run past him on many occasions, one of them resulting in Chelsea’s fourth goal. The scoreline isn’t very generous to Stoke because they had some excellent scoring opportunities and should have punished Chelsea at least once. Their initial approach was effective, and the visitors had a hard time stopping them in the first half. However, the individual mistakes from Fletcher and Johnson were the biggest problem for the Potters. When Chelsea started paying more attention to Shaqiri, Mark Hughes decided to change his approach by introducing Peter Crouch. However, Antonio Conte reacted very quickly to everything and limited Stoke’s strong spells as much as he could. It was a deserved victory for Chelsea, but the game could’ve had a different outcome if Stoke were more clinical with their finishing. Chelsea fan who loves to analyse the tactical side of football matches.